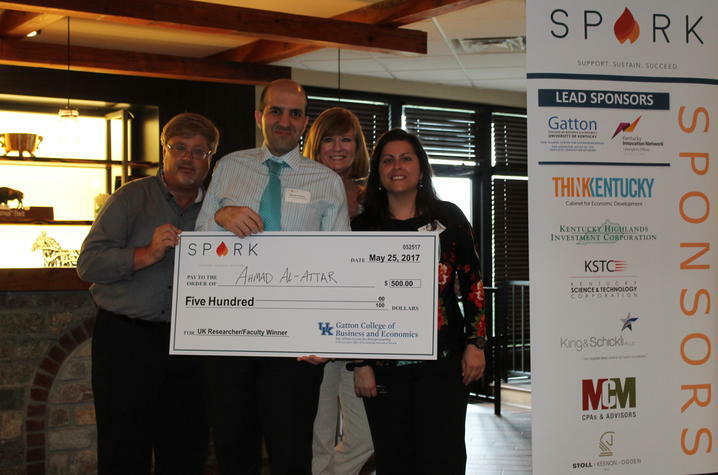 LEXINGTON, Ky. (June 5, 2017) — As a part of the ongoing SPARK networking series, the Von Allmen Center for Entrepreneurship (VACE) & Lexington Office of the Kentucky Innovation Network along with Commerce Lexington, its partner in the Bluegrass Business Development Partnership (BBDP), recently hosted the third annual Bluegrass Showcase of Emerging Entrepreneurs and University Researchers at Copper Roux in Lexington. This event showcased 13 local startup companies all of whom are VACE clients. Three of these companies, Hummingbird Nano, Enepret and Signal Solutions are University of Kentucky (UK) based companies with intellectual property. Dave Jensen – College of Dentistry. Both the companies and the researchers were required to give two-minute pitches about their products or research to an independent panel of judges. Companies were judged on strength of their idea/product, the presentation and tabletop display. Using their research posters as a backdrop, UK researchers were judged on their knowledge of customer/market, the ability to describe the problem which they were attempting to solve, and the clarity of their pitch. A prize of $500 for the winner of each track was provided by the Lexington Office of the Kentucky Innovation Network and the Von Allmen Center. 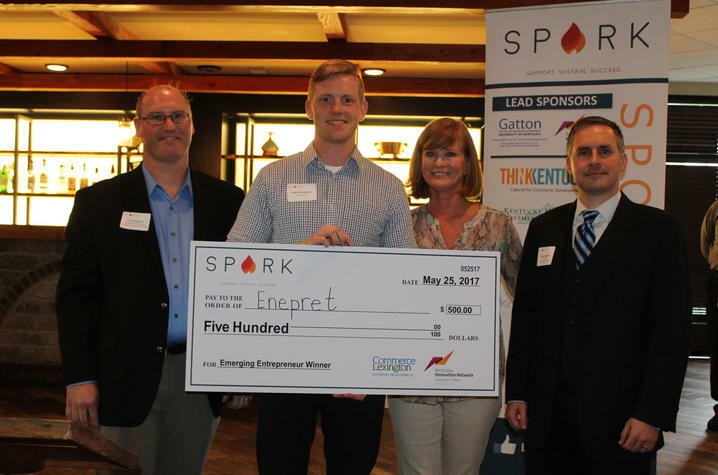 The top spot in the company track went to Enepret, founded by UK College of Pharmacy faculty member Joe Chappell and pitched by postdoctoral student Chase Kempinski. Kempinski completed the Venture Studio Bootcamp in the fall of 2016 and is currently in the first pilot program of UKAccel — a new initiative through UK’s Office of Technology Commercialization (OTC) partnered with the Von Allmen Center. The winner of the UK researcher track was Ahmad Al-Attar from the College of Dentistry. Al-Attar also won the Center for Clinical and Translational Science (CCTS) two-minute poster pitch earlier this year. The Von Allmen Center for Entrepreneurship & Lexington Office of the Kentucky Innovation Network is part of UK’s Gatton College of Business and Economics.